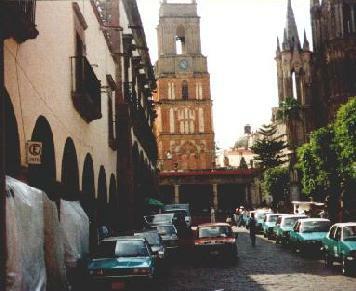 The picturesque city of colonial Mexico lies about 165 miles northwest of Mexico City. 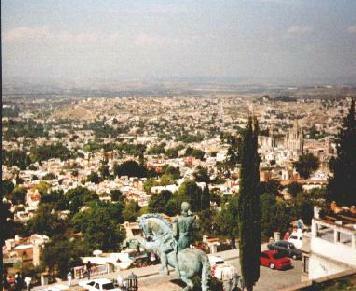 Although the population growth that has put pressure on Mexican cities is evident here, many Norte Americano gringos see fit to make their winter home here attesting to the fact that with population density comes some advantages. The narrow streets, extensive marketplace, central square (where you can meet fellow gringos in a beautiful park bench setting), and large walking park (behind the central church) all help make this city shine as a romantic destination. From the hills to the east you have a tremendous view of both the city and the countryside that extends to the horizon, quite a wonderful contrast to the narrow city streets and crowded market areas. On the right is the view of the central square area that I first saw when I visited here. The greenery on the right is the actual square. My initial impression on seeing it was that it rivaled any parque central in the best little cities of Spain. 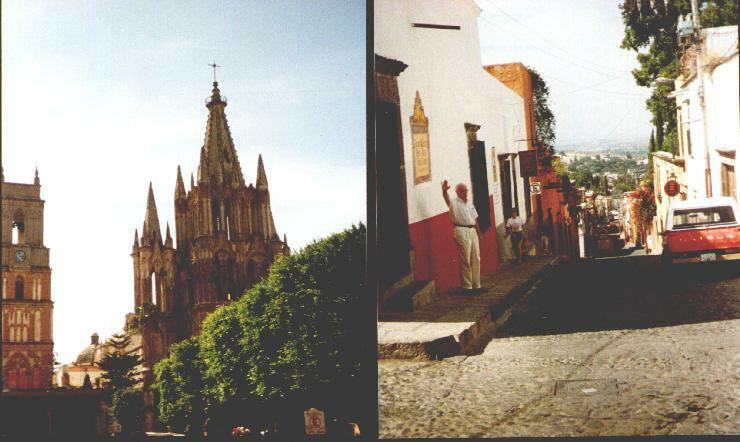 Here on the left; you see a better view of the church spire in the center of town and on the right the coblestones of a typical street for which the city is famous.